Matthew Peterson: Now let me ask you a bonus question here. Now, tell me about the annual Dark Hunter fan convention in New Orleans. I hear it’s really popular. It’s called the K-Con? Matthew Peterson: What is that convention about really? First time we did it, we did it kind of on a lark going, “Sure, I’ll be down there this weekend.” I had no idea [laughs] that people were really serious, they’d actually pay money to come down there and see me. So it grew out of that. It’s just once a year. We keep it small, unfortunately, because I’m only one person; we keep it down around 150 people, and it usually sells out as soon as we open it. Matthew Peterson: Yeah. You’d get mauled if you had too many more people. Matthew Peterson: Yeah, yeah. So is there like a waiting line to get into it? Sherrilyn Kenyon: Yes, we always have one. We had several... I think one year--this year or last year--it was just over 1,000 people were on the waiting list. Matthew Peterson: I went to the Discworld Convention. Matthew Peterson: The first North American Discworld Convention with Terry Pratchet. Sherrilyn Kenyon: That’s really cool. Matthew Peterson: That’s where I met him, just a few months ago. Sherrilyn Kenyon: Oh, I love his work. He’s wonderful. Matthew Peterson: Yeah. And he told me that was the first North American one, but you know they’ve had ones in Australia and other countries. So what he does is... so that he doesn’t get mauled. He’s a very people person, but sometimes it’s a little bit claustrophobic. Matthew Peterson: So he will have a badge with a different person’s name on it. Matthew Peterson: And everybody knows what he looks like. I mean, he’s very unique, you know; we know what he looks like. Matthew Peterson: So I thought that was very interesting. Let me ask you really quick too. You mentioned that your book was one of the very first ebooks published. What made you decide to go that route and kind of jump on that bandwagon? That was a new technology, very unknown. What made you decide to do that? Matthew Peterson: [laughs] What made you decide to pioneer that new technology? 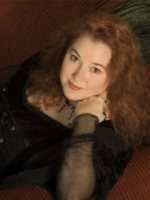 Sherrilyn Kenyon: Back then, if you were an ebook author, they were like . . . it was below even vanity publishing. I mean, they really . . . people did not understand it at all. Because I’ve always been very much a tech person. My husband jokes I’m a cyborg and as soon as I can wire the internet into my brain I’ll be happy. Sherrilyn Kenyon: It spoke to me because I saw the wave of the future. I’m like, “This is what books’ll evolve into.” And I really wanted to be part of it, and at that time traditional publishing was all but lost to me. So I’m like, “Well, this is a viable way.” To me it’s more important that people are reading the books and enjoying them. I mean that’s why I do what I do. Sherrilyn Kenyon: So it was just a way of reaching a whole new audience. And you know I’m very glad and proud to see the way--not that I had anything to do with it other than the one book--to have seen the way ebooks have grown over the last 15 years. It’s just incredible. Sherrilyn Kenyon: And you have with different clans, you have a certain dynamic, and in the case of Amy, her mother is very much a bear, all the way around, and you know: we keep to ourselves, you don’t mix with all these others, even though they have others, their sanctuary. Sanctuary’s kind of a place where... it was founded after Amy’s older two brothers were killed as a refuge for all the different countries where they could come in peace or leave in pieces. And her mother’s been running it. So she will tolerate the other branches, but she definitely doesn’t want her daughter mixing with them. And then in the case of Fang, his brothers, both of them, they’re distinct . . . I know it’s so complicated . . . it’s the reason we have a huge compendium for it. There’s two branches of the were’s. There are those that are human based in their life forms and there are those that are animals who are capable of taking human forms. In the case of Amy, her mother is a bear that can take human form. In the case of the Wolves, Fang is a mix; his mother was a human and his father was a wolf, and so his brothers ruled Fapatria for the animals and for the humans. So very precarious situation. Matthew Peterson: Yeah, what’s that book about? Sherrilyn Kenyon: Hell, as in the goddess Hell, from Norse mythology. I’ve actually been wanting to do something with her for a while. I do the Children of Fen Reer. And they were guardians to Hell and they were in planned and now they have broken free. But Morgan Lythay, who is the big villain of the series. When Arthur was king, there were 13 sacred items that he used to rule with, and when he died what they did was they spread them out. There’s a Merlin actually in charge of each of the different items. And the heroine in the particular book is the guardian to the shield of Dadga. And Kadzill, who is the Hellhound, has to . . . he’s supposed to get it away, because Morgan has his sister and if he doesn’t get this shield, she will kill her. Matthew Peterson: Oh, okay. So that book’s coming out in March.